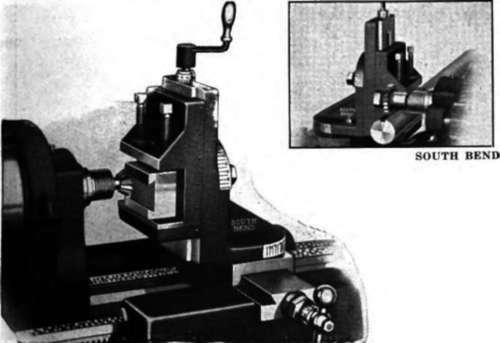 Shaping-cutters, either mounted in the drill-press or on the conventional wood-shaper, have been used very successfully on plastics, the only requirements being that the edges should be ground so that at the point of contact the cutting-edge is on a straight line to the center, and that the speed be high. Since most of these cutters have only two or three teeth, it can easily be seen why the speed must be very high. If all conditions are exactly right, the finished edge is so smooth it hardly requires sanding. Ordinary disc-sanders (Plate S.) drums and belts (Plate P) suitable for woodwork are used for working plastic, there being no special requirements or alterations. As in woodworking, at least three grades of abrasive paper should be available—very coarse for fast shaping operations, medium for removing the marks of the coarse paper, and a very fine grade (No. 6-0 or 8-0) for finishing. Garnet paper is by far the most desirable for this work, and the best type of garnet is the type that is "electrified", i.e., there the grains are made to stand on end while being glued to the sheet by a special electric process. The reason for this is that ordinary papers clog up so easily with this material that they quickly become useless. PLATE S. (Right) Using S disc-Bander for shaping the handle of the cream-and-sugar set described in Project 31. The same caution previously referred to regarding heating should be born in mind when sanding, and that is that the material dissipates heat very slowly, and hence can easily become "burned" if too much power is applied too long in one spot, or if the tool is not sharp or the sandpaper not cutting. Sanding, and especially the final fine-sanding, is the most important step in the finishing of plastics. Unless every last tool-mark or coarse sand-paper mark is removed completely with the fine sand-paper, your final finish will be marred with these scratches. Plastics takes such a high, mirror-like polish that it quickly "shows up" these irregularities and un-removed scratches, so any time spent on this particular operation is well worth while. As said regarding all other tools—never waste time or endanger your material by working with dull tools or dull sandpaper, when a new sheet will cut the labor and time to a fraction and insure a perfect job. Grinding Wheels Grinding wheels are particulary useful for working plastics in various methods, such as carving, turning, shaping, etc. In all cases, a coarse, open-grained wheel must be used, as finer-grained wheels will clog, heat up and burn the material. This applies whether the wheel in question is a 1/8" diameter mounted point being used in a small electric hand-grinder, or an 8" wheel in a grinding-head. Grinding wheels are frequently used for rough carving instead of steel or metal cutters, as they never become dull, can be shaped to desired contours, and do not require such high speeds as cutters because each grain of abrasive is, in effect, a cutting-tooth. An illustration of the use of such a wheel in rough-carving is given in Plate 3-0. Probably the handiest shape is an 8" diameter wheel with a 1/2" face, having the corners rounded off. Such a wheel is ideal for shaping rings and other material to be carved and finished. It should be driven at about 1800 to 2500, although higher speeds will do no harm.